Our range of products include industrial planner machine. We have a team of trained technocrats having profound experience in dealing with all sorts of Industrial Planner Machine. Our planner machine is widely used in different industrial applications. We are in the midst of famous two side planner machine manufacturers, based in India. Made from top quality raw material, our planner machine is globally praised for its superior quality. It is the double rigid column and body before system planner fitted with ball bearings. The bed: The bed is of deep box section type and is tied together at frequent intervals by double walled bridge pieces extending to the bottom of the bed. The table: It is of box section type and is streamlined with hand scraped 'V' way to bear the heavy load. 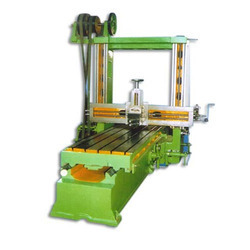 It is heavily ribbed and the Rack provided in it is accurately machines and milling cut. The bearings: The main bearings for the Gear are cast solid with the Bed. Thea Gears Teeth are hobbled machine cut Except two gears are helical. Gunmetal bearings have been provided for all the shaft and loose pulleys. Taper roller bearings can also be provided instead of Gunmetal bushes. The cross rail: This is of Box section type with the large surface. It is suitable for both hand and mechanical drive. Tool posts: These are manufactured out of close grain alloy castings and steel to stand heavy cut. These can be driven both manually and mechanically. The uprights: The uprights are of rigid box section type. Firmly, bolted on to bed and are capable of absorbing the heaviest shocks without vibration, Extra pins are provided to re-fit the machine accurately after once it is dismantled. The drive: The machine is arranged for the direct individual as well as two belt drive. Looking for Industrial Planner Machine ?